Located in the center of Pinar del Rio on Calle Marti, the Museum of Natural Sciences presents a summary of the evolution man as a species, also covering from the birth of life until the origin of humankind. 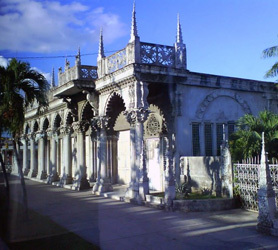 It is located in the ancient Guasch Palace, amongst the most outstanding buildings in Pinar del Rio, the Palacio de Guasch was built in 1909 by a prominent doctor who wanted to incorporate some of his favorite architectural styles into his own home. Among the species on display there are artifacts of primitive fauna. Also real fossil remains of a plesiosaur, a marine animal that inhabited the waters that, millions of years ago, once covered the land which is now the famous Viñales Valley. Palacio de Guasch is a unique building and worth seeing even if natural science is not your thing, it’s a mixture of Moorish, Gothic, and baroque styles that are combined into an incredible mishmash of styles.